I try to be a serious boxing writer and cover serious boxing issues. I paid as little attention as possible to Floyd Mayweather’s hyped-up circus act with Conor McGregor. I almost never make reference to “Twitter beefs” or TMZ-type gossip. 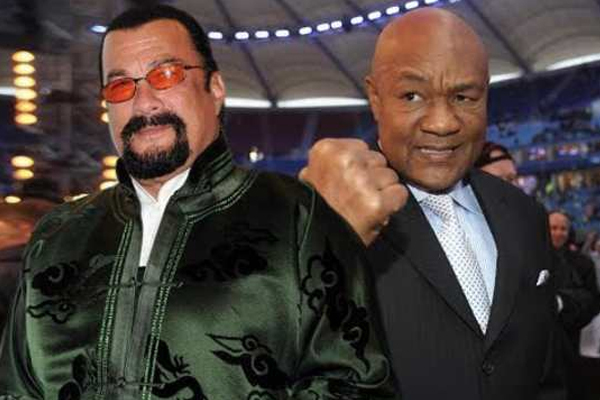 But last week on Twitter George Foreman called out Steven Seagal, challenging him to a no-holds barred fight. And I am giddy over the prospect that it could happen. I’m not exactly proud to admit that I would gladly pay to see a 68-year-old retired boxer fight a 65-year-old celebrity. But I would. Somebody out there put it on pay-per-view and you can have my 80 bucks. Foreman, for all his smiling charm, is as real as it comes when you talk about combat athletes. He is easily among the top-five heavyweight boxers to ever walk the planet. He is such a scary physical specimen that by the time he was 14, he was shaking down fully grown street thugs in the toughest part of Houston. He moved on from his juvenile delinquent ways to take up boxing. He won Olympic gold after a ridiculously short amateur career. As a professional, he was one of the scariest men to ever enter the ring. Along with Sonny Liston, he had the biggest hands of any boxer ever measured. He required specially made gloves. His power was so dangerous he knocked out countless professionals with arm punches. He demolished Joe Frazier twice–a legitimate top 10 heavyweight in his own right. He easily hammered Ken Norton, a man who gave Muhammad Ali all the Greatest could handle in three different fights. Foreman famously lost to Ali in 1974. He retired after a stunning loss to Jimmy Young in 1977. But then, in 1987, he launched one of the greatest comebacks in the history of sport. Older and wiser, he emerged as a true contender in the 1990s, another great decade for heavyweights. In 1994 he knocked out Michael Moorer to become the oldest lineal Heavyweight Champion ever. Seagal is a lousy actor who has starred in a number of lowbrow movies. There would be nothing objectionable about this if he wasn’t also the quintessential fake tough guy–an “action star” who has swallowed his own hype. His smarmy efforts to pass himself off as legitimate have turned the stomach of many a true fight fan. There’s zero chance he accepts Foreman’s challenge. But we can still cross our fingers and dream.